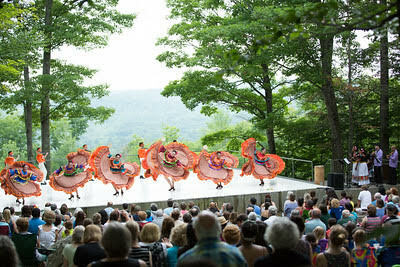 The Henry J. Leir Stage and Marcia & Seymour Simon Performance Space, comprise the this outdoor amphitheater with a panoramic view of the Berkshires Hills for its Inside/Out Series. An essential part of the Pillow’s mission and a beloved tradition is to offer free programs to the public. Audiences of all ages and walks of life travel from around the world and right down the road to meet new people and enjoy the art of dance as a community. Every year Inside/Out performances feature a variety of styles. Past performances have included classical ballet, tap, jazz/musical theatre dance, hip-hop, flamenco, traditional Korean dance, India’s bharata natyam, and many other genres. Performances are family-friendly and are followed by a brief question and answer session with the audience. Patrons are welcome to arrive early to claim a seat or to bring chairs from home. Food and drink are welcome in the performance space.